Often referred to as "people of the forest," orangutans are quick learners, eager to copy behaviors they observe. 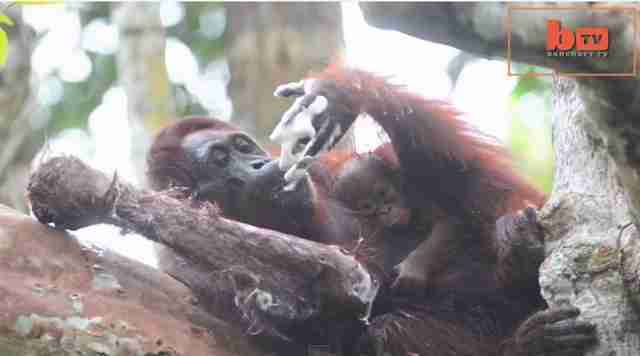 But one orangutan in the Tajung Puting National Park in Borneo took mimicry to a whole new level. 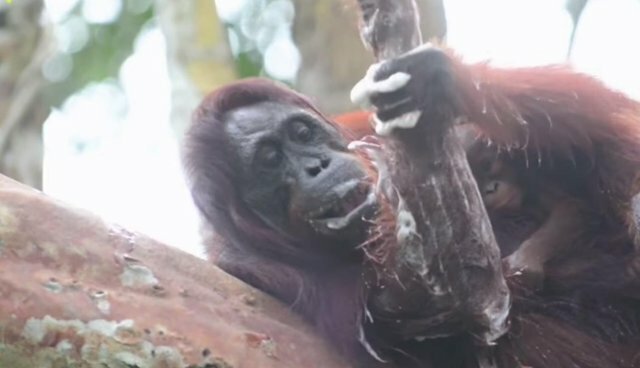 After reportedly stealing a bar of soap from a passing tourist boat, a mother orangutan was observed lathering up her hair with bubbles. Many of the orangutans living at Camp Leakey, where the clip was shot, were born in captivity but released into the wild - so they've picked up behaviors that are strikingly similar to ours. In 2002, naturalist David Attenborough visited Camp Leakey, meeting an orangutan who also developed several humanlike characteristics. The orangutan could row a canoe, saw a piece of wood, wash with a washcloth and even use a hammer and nail.